It didn’t take long after we originally tuned Sam’s 2012 Black Edition GTR on 91 octane and E85 that we upgraded turbos. An oil leak on the passenger side turbo oil feed line helped that decision! Bigger turbos on a stock motor! An option that actually works very well when performed properly. 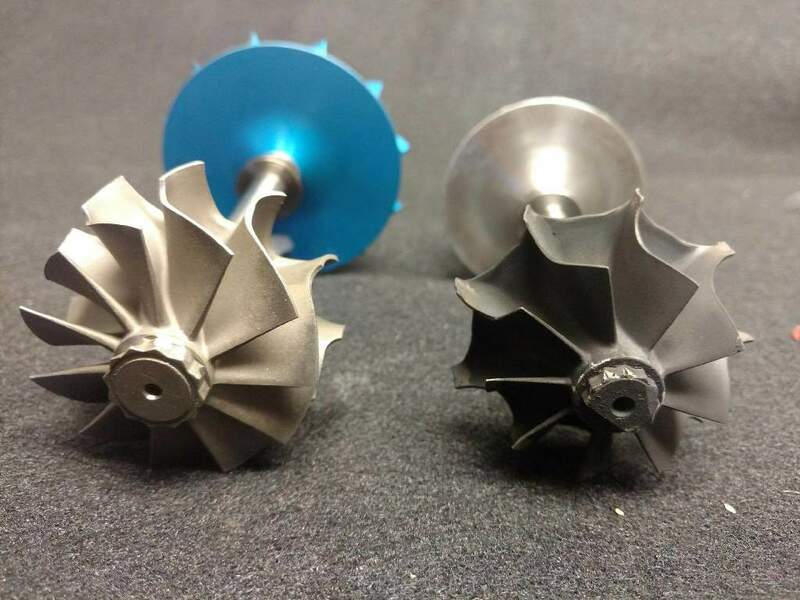 The stock turbos are small and lose their efficiency at the higher RPMs. They have trouble holding boost and terrible back pressure ensues. With the engine out we went to work pulling off the stock turbos and finding the culprit for the oil leak. 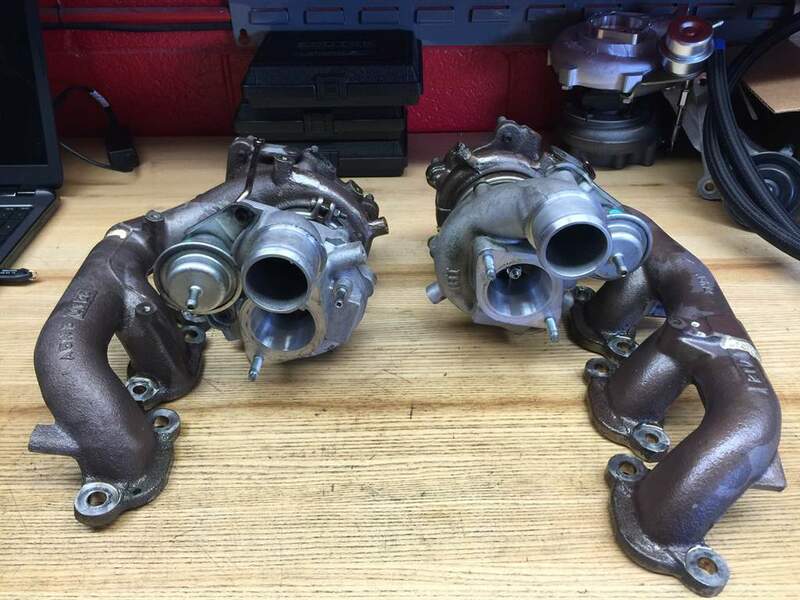 The stock turbos before they go in for surgery. The passenger side turbo oil feed line pictured above. This portion of the line bolts to the top of the turbo with a banjo bolt and crush washer. 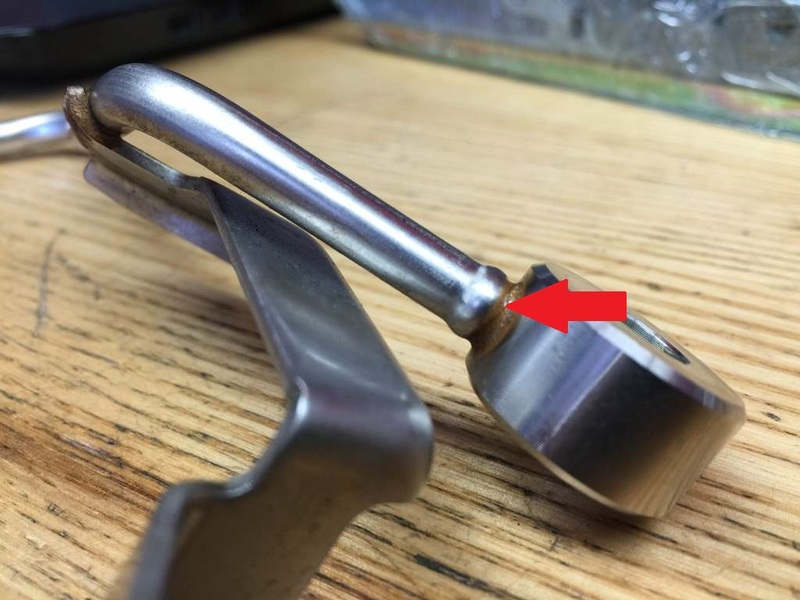 If you look closely you can see the red arrow pointing to the crack in the brazing of where the line meets the banjo fitting. This is somewhat of a common issue. Nissan has an updated part for both the oil line and a bracket (2014+). The “old” bracket on the left and the new on the right. You can see that the new bracket has an additional provision to support the oil feed line. The new line has an additional winglet to bolt to the new bracket. 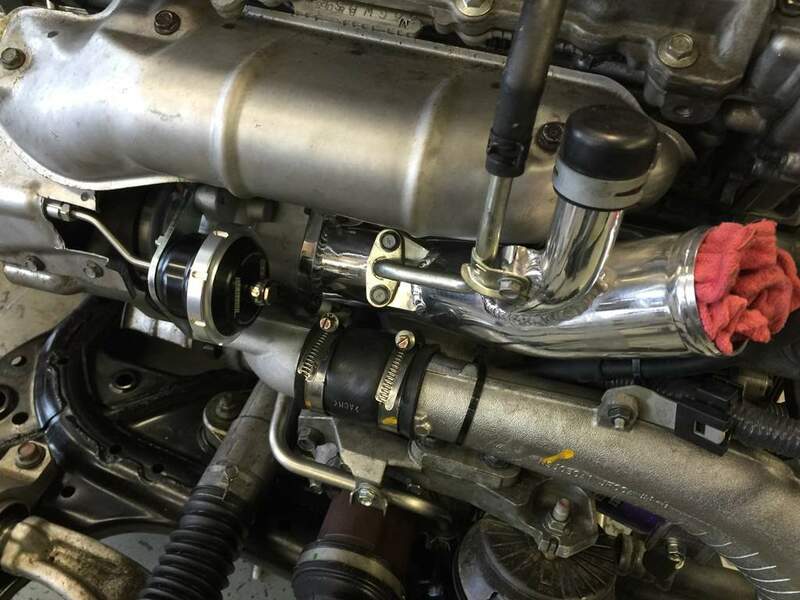 Our turbo upgrade came from RD Engineering. 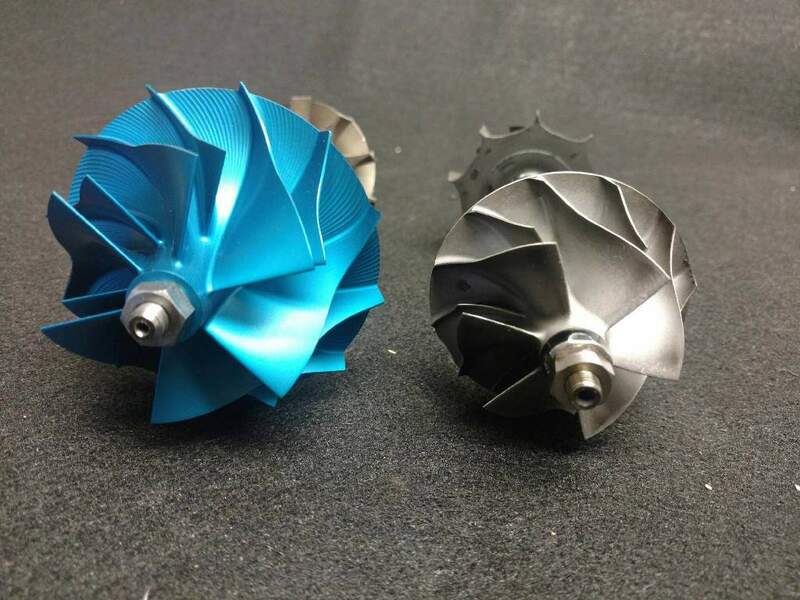 The anodized blue wheel on the left is the upgraded compressor wheel and the factory GTR compressor wheel on the right. A rather large difference! Turbine wheel also gets upgraded to help decrease that pesky back pressure. The only other upgrade performed while we were in there were GTC Turbo Inlets. GTC on the left and the factory DBA inlet on the right which is already larger from the CBA (2009-2011) models. The upgraded turbos feature Turbosmart actuators. Above is the 91 octane dyno graph differences. Sam’s GTR has basic bolt-ons so the results can be better with modifications like an upgraded intercooler, intercooler piping, etc.. Blue was the power on stock turbos. Red is the upgraded turbos. 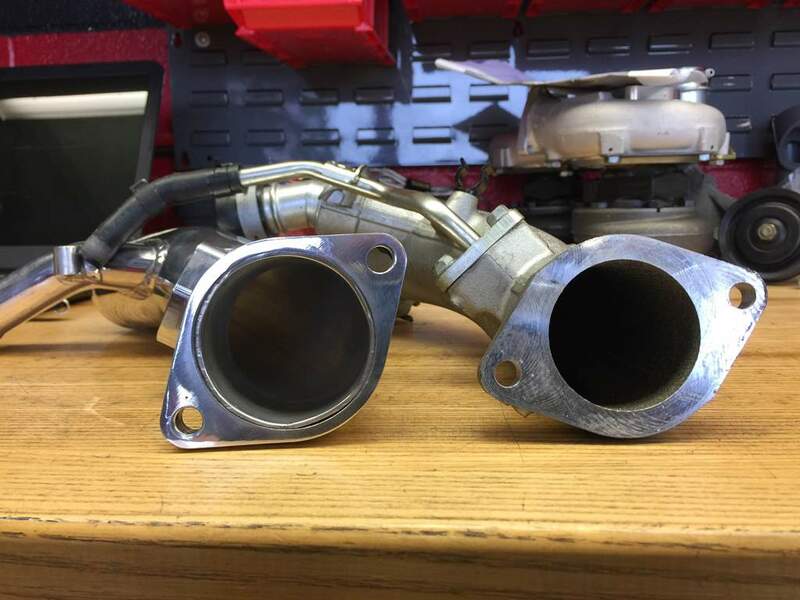 This upgrade essentially allows one to run E85 FBO stock turbo power levels on 91 octane. A nice upgrade indeed if you don’t have E85 easily accessible. By 3500 RPMs the larger turbos start to take over on the stock motor and cams. As mentioned previously, more “breather mods” can help this. We’re also forced to limit our torque output with the stock connecting rods. Our E85 dyno graph. Blue is stock turbos (please excuse the RPM cut) and red our upgraded turbos. Again we are having to severely limit our torque output on E85. The potential with these turbos on a forged motor is much more. One can see that the stock turbos hit rather hard in the beginning. If you look at our cursor pointing at 6500 RPMs you can see how much the stock turbos fall off on boost where the larger turbos shine. 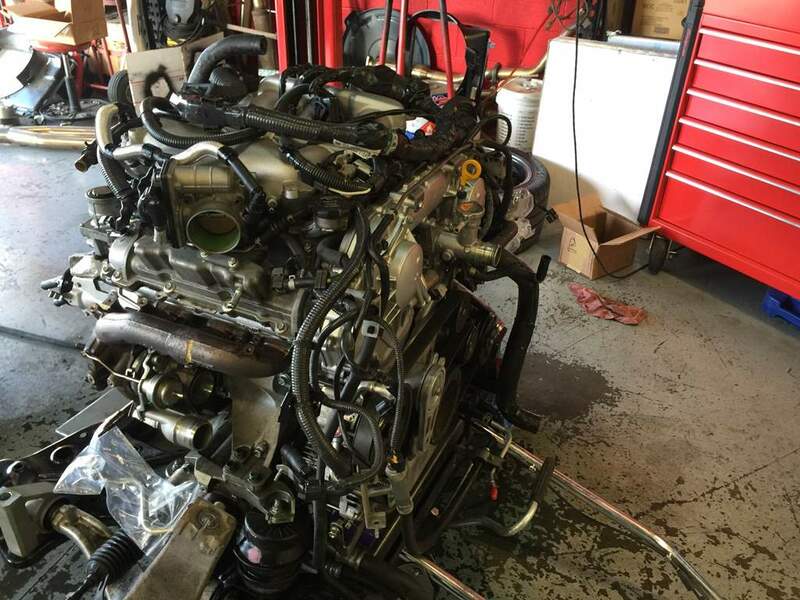 This is a reminder that upgrading actuators on the stock turbos is not recommended. Your only increasing your back pressures which are horrendous for the engine. Close to 800 whp on a stock engine and still able to keep the torque level in check which is the achilles heel of the factory GTR shortblock. Original Wings West Z32 TT for Sale!